Sleek, sophisticated, and practical, the new 2019 Porsche Macan S is a great crossover SUV for drivers looking for a high-class, versatile drive. Whether you’re commuting for work, or taking the kids to school, enjoy the upscale design and comforts of the Porsche Macan S.
The new 2019 Macan S gets its power from a turbocharged 3.0-liter V6 engine, that’s capable of producing up to 348 horsepower and 352 lb-ft of torque for a powerful drive. These specs translate into a top track speed of 157 mph and an acceleration rate of 0-60 mph in as little as 4.9 seconds. It can also tow up to 1,653 lbs., so it’s ready for whatever your next adventure has in store. 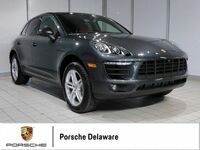 To learn more about the available specs and features for the 2019 Porsche Macan S, be sure to take a look at the Porsche Delaware Blog below. You can also compare the Macan S model to the standard 2019 Macan model by checking out our review for the 2019 Porsche Macan. 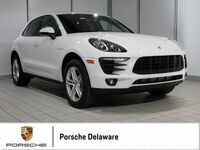 Those interested in getting behind the wheel of the new 2019 Porsche Macan S, which is available here at Porsche Delaware, simply give us a call or contact us online by clicking the button below and we’ll be happy to work with you to set up an appointment for a test drive.